A fusion of British quality with Indian prints and craftsmanship. 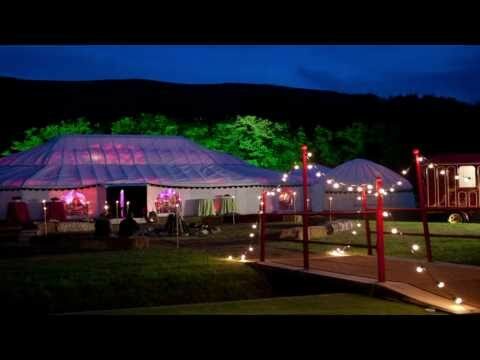 India has become synonymous with beautifully crafted tents and marquees. Used for all manor of occasions from Weddings to Polo. 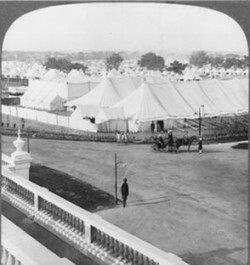 Tents became a symbol of status amongst its elite with the Moghul princes and Rajahs making decisions of court sat within their tented palaces bedecked in fine fabrics and furniture. An opportunity to express their wealth and status not missed by the British during the days of the Raj who also opted to hold occasions such as the Delhi Durbar under canvas. Parts of India, especially in the North, have a long tradition in manufacture of canvas tension and frame tents using cotton canvas for the outer skin as well as using decorative silks and block printed or silk-screened decorative fabrics for interior linings. Despite unquestionable craftsmanship there are possible quality control problems in buying complete structures from India due to the European climate causing leakage, rot and mildew problems as well as safety issues with fire proofing and other Safety essentials. LPM Bohemia manufacture to a high quality European specification using 100% cotton canvas treated in the UK. We utilise traditionally crafted Rajasthan block printed fabrics from suppliers in India and adjusted them in the UK to suit European standards. Please feel free to enquire more about specific material options. Standard sizes range from between 10’ square to 30’ square but do give us a call to discuss bespoke sizes and the details you would prefer. How long should my Indian tent last? Depending on type of design any time from 10 to 30 . If you have a frame structure the frame should last indefinitely if looked after. The life of the cover will depend on the materials chosen and how long the tent is left up at one time. Careful storage and treatment will ensure a longer life – please ask for advice. How long does an Indian tent take to erect? With a little practice a 20’ square Indian Frame tent can be erected by 2 people in under 2 hours including all linings. Although any Maharajaor Maharina worth their salt is unlikely to be seen erecting their own tent it is a fun process with enormous satisfaction – a little like building your own house. Whats involved in storing my Indian tent? The key here is keep it dry. Try and choose a Sunny day before packing away all materials dry and in a breathable bag (a canvas bag is supplied with your purchase) Avoid plastic containers or storage areas prone to condensation. The fabrics do contain a powerful anti-fungicide but mildew rot will creep in if they are packed away wet.